This holiday will appeal to independent travellers who are used to a variety of different experiences on their holidays and do not mind being flexible. Comfort levels on Sandals and Dahabiyyas are high but Feluccas are very basic and have no bathroom facilities. Food is local produce cooked Egyptian style, and vegetarians are welcome. 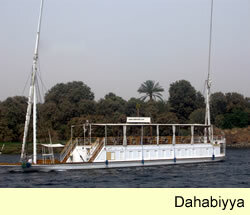 There are 3 meals a day, and on the Dahabiyyas and Sandals, dinner is 3 or more courses. Be aware, safety standards are not the same in Egypt as they are in western countries, although all reasonable precautions are observed. (Boats are regularly inspected by the river police.) For this and other reasons we would respectfully suggest you do not bring young children. You will find travelling games, cards and good books welcome additions. On request the crews will often provide an impromptu performance of traditional Arabic music in the evenings. However you may just like to enjoy the silence broken only by bird calls, donkeys braying and cattle lowing, and get back to nature, Egyptian style. Unlike the holiday companies on the cruise boats we do not force you to give set amounts of baksheesh or tips to the crew. The amount you give is entirely up to you but please remember this makes a big difference to the lives of these men and is very much appreciated. 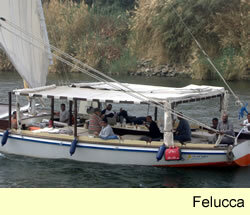 Want to spend more time in Luxor ? We work in conjunction with Flats in Luxor the premier accommodation group in Luxor, with a wide range of apartments, flats and villas available for rent (and sale 🙂 ). This means we can offer combination river and land based holidays. See here for a list of possible land tours. 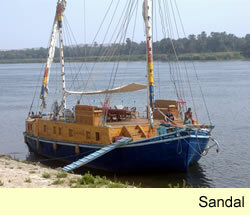 If you want more after the delights of Luxor , we can arrange tours to Cairo , the Western Desert and much, much more.